A world in UNIGINE is a scene that includes a set of different built-in objects with certain parameters. UnigineEditor provides an ability to create new worlds, load or reload existing ones and save them if any changes are made. You can also adjust various settings for the worlds you create. 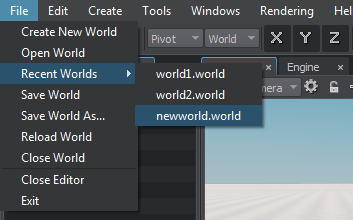 Click File -> Create New World in the main menu, or press CTRL + N.
In the window, that opens, specify a name for the new world and choose the target directory within your project. newworld.world - an XML file containing rendering settings of the created world. newworld.cpp - a world script. A new world with default sun node will be created. You can keep this node or delete it at your own discretion. Click File -> Open World in the main menu, or press CTRL + O. Choose the directory and select the required world. Via UnigineEditor, you can only load worlds that are available within your project. Click Ok. The selected world will be loaded. 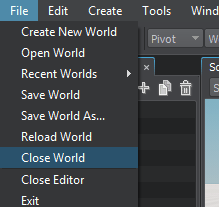 To load one of the recently closed worlds, click File -> Recent Worlds in the main menu, choose the required world and click it. 4 recently closed worlds are available. 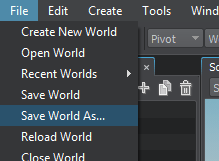 Click File -> Save World As.. in the main menu. 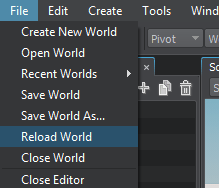 Click File -> Save World in the main menu, or press CTRL + S.
Click File -> Reload World in the main menu. If there are unsaved changes in the world, the dialog box will open. Click Yes in the dialog box to save all changes before reloading. Click File -> Close World in the main menu. Click Yes in the dialog box to save all changes before closing. The world will be closed as a result. 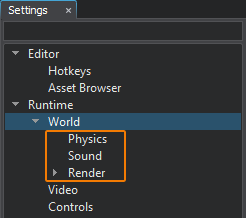 Each world can have its unique sound, physics, and rendering settings. This allows you to adjust everything from gravity to how the Global Illumination will look in a particular world. All world settings are available in the corresponding section of the Settings window. Click Windows -> Settings in the main menu. 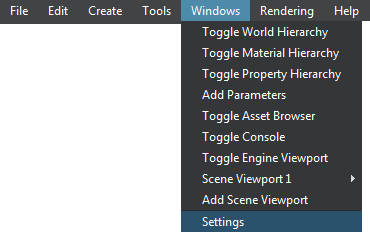 Then in the left panel of the Settings window choose the desired section from Runtime -> World. Learn more about the Settings window.